A while back, I wrote a post called ”Money You Might Be Missing Out On” where I discussed the Linkshare API. Well, I took it upon myself to create a simple tool that I have been using in my blog posts to quickly generate affiliate iTunes links for iPhone apps. Here is a screenshot of the app. The generator is quite simple and perfect for bloggers that are discussing apps. Here is how it works. Enter your LinkShare Token. You get this in the Web Services section if the LinkShare site when you sign up. Select a merchant. By default, I have already populated it with Apple iTunes. Linkshare supports thousands of affiliate programs, so you can click other if you are using it for something else besides the app store. 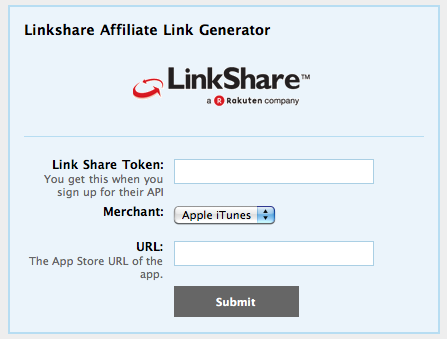 Now, it will interface with the LinkShare API and produce an affiliate link for your account.